The journal Environment and Behavior published "Advancing Translation and Dissemination Research and Practice Through the Physical Activity Policy Research Network Plus," authored by four Network Coordinating Center members. The commentary piece discusses origins of the Network and outlines the organization of its research, working groups, and communications progressions. To read the article, please click here. Click here for a new resource on how local health departments with the fewest resources can increase active transportation. This resource is the first in a three-part series covering the Capabilities for Public Health Agency Involvement in Land Use and Transportation Decision Making to Increase Active Transportation Opportunity from the UMass Worcester Prevention Research Center. Click here to watch Willie Murphy, a power lifter, inspire people of all ages to get in shape. Click here to download a guide to creating physical activity plans for your community! Working groups have been developed and are conducting research. Research projects and results will be added when available. Click here to explore some of our recent Working Group calls. The Physical Activity Policy Research Network Plus (PAPRN+) is a CDC-funded network that advances policy research to increase the number of Americans who achieve adequate physical activity to promote and sustain health. The primary focus of PAPRN+ is to conduct research that will serve as the basis for improved strategies for translation, dissemination, and implementation (TDI), with an emphasis on non-health sectors, including enhancing the ability of health departments to collaborate effectively with non-health partners. 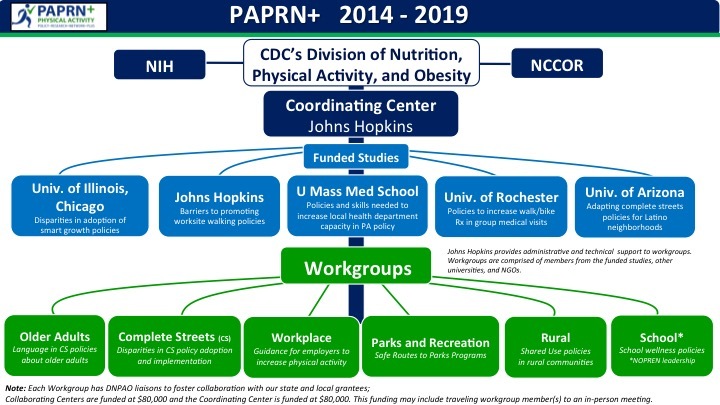 PAPRN+ will focus on policies that increase walking, which is the most popular form of aerobic physical activity in the U.S.
Click here to view our Network's organization, including funded study institutions and research workgroups. To sign up for the Network mailing list and join monthly calls, please click here. For additional questions, email the Network at PAPRNplus@gmail.com.